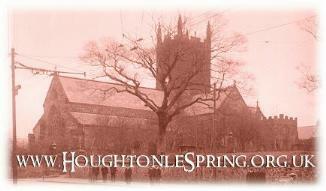 Houghton-le-Spring Heritage Society was formed to promote, share and preserve the local history of the Houghton-le-Spring district. 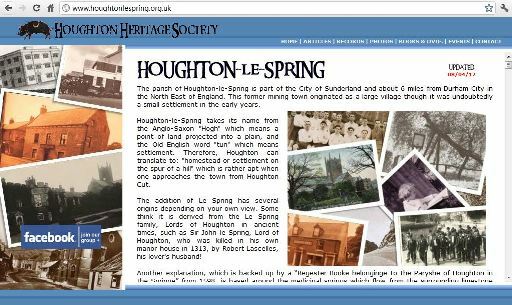 The Society uses the Internet to share aspects of Houghton-le-Spring's heritage which otherwise would not be accessible to the public, including those in (residents) and beyond the town's boundaries (descendants and expatriates). The Society actively records current aspects of Houghton which will be of interest in the future, preserves and/or reintroduces local traditions and customs, and supports schools and educational establishments in the Houghton district with the promotion of our local heritage. This non-profit website is the culmination of 10 years' worth of research. Launched in 2007, it features a wide range of exclusive articles and photos. Like all good websites, the site incurs hosting and running costs. These costs are met through generous donations and the sale of local history publications through the site. Without your support, this website would not be online. To support schools and educational establishments in the Houghton district with the promotion of our local heritage. Houghton Heritage Society is pleased to have actress PENELOPE WILTON OBE as Patron of the Society. Penelope is known to millions as Mrs Crawley in 'Downton Abbey' and also as Harriet Jones in 'Doctor Who'. Penelope is currently starring in 'The Best Exotic Marigold Hotel' (in cinemas now). Penelope Wilton is the niece of 1940s actress, Linden Travers, who was born in Houghton-le-Spring, and is the Great-Great Granddaughter of Houghton confectioner, George 'Sticky' Wheatley. Photograph from ITV Downton Abbey Press Pack. Houghton Heritage Society could not operate without generous donations from those who support our work. You can find out how to make a donation and have your name recorded in our illuminated Book of Benefactors & Supporters by clicking HERE. Articles and information are presented in good faith, occasionally based on people's recollections and memories, which can be fallible. While every effort is made to ensure the website content is accurate and up to date, some errors may exist, such is the nature of recording local history. No responsibility can be held for any errors contained herein and Houghton Heritage Society would like to invite any recommendations, corrections or additional information from the site's visitors. All none-original content on this website has been included with the creator's permission, where required. All reasonable effort has been made to contact copyright holders for permission. Any errors that may have occurred are inadvertent and anyone who for any reason has not been contacted is invited to write in so that any omissions/errors can be rectified when the site is next updated. The Houghton Heritage Society website is updated frequently, with published articles often being amended or added to. Regular visitors can keep abreast of the updates by visting the Updates Blog. Photographs can be emailed via the email address on the contact page. In your email, you should indicate the approximate date of the photograph, the location, the names of any people featured, and any further information of interest. If sending more than one image, please send each attached to a separate email. TOP TIP: If your images are in an album, lie the page flat against the scanner, close the lid carefully, and cover with a dark towel while holding the lid down. This should prevent any light entering the scan area. If you do not have a scanner, please contact the Society for assistance. In 10 years, we have borrowed thousands of photographs and all have been looked after carefully and returned in their original condition. This website has been designed to be viewed using Google Chrome (or equivalent), viewed on a monitor with minimum screen size of 12 inches. Scroll bars should not appear across the screen bottom. Due to the large image content, this site is best accessed across a high-speed/broadband connection. Articles and images are placed online at the Society's discretion and may not be copied without the copyright owner's permission. Content is periodically and systematically taken offline for extended periods of time. Visitors are permitted to view the articles/images online. By viewing the articles/images, visitors agree to comply with copyright licensing regulations, which state that your use of the article/image is for personal use only, and that you will not copy, publish or distribute the article/image in any way without prior permission. Houghton Heritage Society's website has been subjected to plagiarism - the "use or close imitation of the language and thoughts of another author and the representation of them as one's own original work" [Random House Compact Unabridged Dictionary]. Pages have also suffered from copyright violation, where full extracts of text and images have been reproduced without permission nor acknowledgement. Such violations and the failure of those responsible to honestly acknowledge their sources undercuts their own integrity and credibility. In some instances, those responsible have even added their own grammatically incorrect additions, which stick out like sore thumbs, further exposing their plagiarism, and jeapordising the public's willingness to share photos and memories in future projects. Each contributor has asserted the right to be identified as the author of their original work on this site in accordance with the Copyright, Designs and Patents Act 1988. To enquire about using or correctly referencing material from this website, please contact us. Help will always be given to those who ask, when possible.